Firms, today, are constantly challenged to avoid commoditization and remain relevant. At the same time, they have the greatest opportunity to position themselves as the most trusted business advisor and offer higher value services that clients want, need and are willing to pay for. The old saying that clients often value what CPAs give away more than they value the services they charge for is certainly true. Most CPAs admit that they are capable of playing above the line, yet not generally by design and, often, don’t charge what their advisory services are worth. Why not? Most will answer that they either haven’t thought about it, or have been too busy focusing on below-the-line services to formalize and price their above-the-line services. 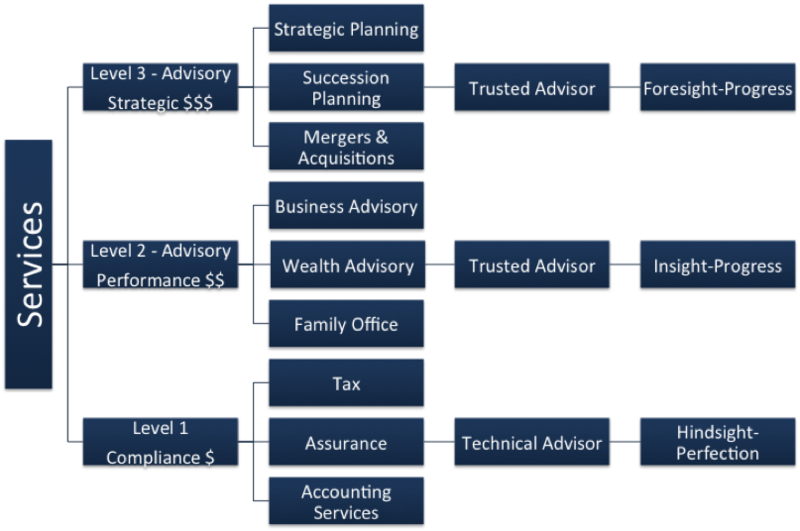 Any good marketing or sales person’s approach would be to start at Level 3 with Strategic Advisory Services. Through the Strategic Planning process, most clients will identify their top priorities, and frequently, there are services from all levels involved. Traditionally, the majority of CPAs start at the compliance level, thinking they can expand into the higher value services, but too often, they get trapped in the compliance level services and never seem to escape. Often, they may wonder why other advisors get the opportunities to provide these services when they, or others in their firms, could have provided the services at a competitive rate and with the same or greater degree of professionalism. The answer is generally attributable to the fact that most accountants are focused on chargeable time and not on marketing and sales. I know there are those who are exceptions, yet one of the first questions asked in firm meetings is about whether time spent with clients in conversations about new opportunities is chargeable! Too often, the question comes from a partner. Determine your top 2-3 market niches, and focus on them. Identify target clients, and filter criteria for new and existing clients. Filter clients who do not fit the above criteria. While this sounds relatively simple, it is generally a difficult change, due to existing partner compensation plans, relationships and fear of the unknown. In order to change, you must generally give something up and, in most cases, it is the smaller clients that only utilize one service. In many firms, this may be the small 1040 tax preparation work. Just remember, what got you to your size today won’t get you to the next level. It will take different strategies, and often times, different clients and people. Your thinking will determine how you solve the problem and the results. The mentality to increase your revenue 10 times over will produce better results for the clients, opportunities for your talent and growth for the firm. Ask what value you can provide, in order to grow the existing client revenue 10 times. You will find that there are many services the client needs and wants above the line, other than tax return preparation. Appreciation – Do they appreciate, and follow, the firm’s advice? Reward – Do they pay promptly and willingly? Enhancement – Do their services enhance the firm’s capabilities and niche markets? Risk – Are potential risks manageable? Referral – Does the client have a good reputation in the business community? Regardless of the niches or industries, you should plan to offer services in all three levels: strategic, performance and compliance, even if you only start with one or two services in the strategic and performance levels. Firms of all sizes can easily start by offering strategic planning services at Level 3, and CFO services at Level 2. You should have these skills even if you have to work on your packaging, pricing and delivery skills. By listening to your clients, you can quickly add additional services within your firm, or by meshing (sourcing) with others. Strategic planning makes sense, as you formalize a process that technical advisors often touch upon but don’t really address the client’s real business concerns and allocation of resources. By going through this process with the client, you identify ways your firm can provide resources to expedite their achievement of goals. We often refer to this as P3 Leadership. The platform (or collaborative technology – often called the Cloud) is the accelerator, and your talent must learn faster than the rate of change and the competition, in order to remain successful and future ready. If you don’t know how to get started, or have differing opinions in the firm, start with a Strategic Plan. 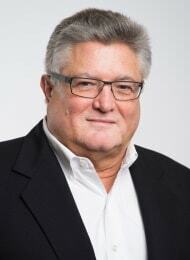 L. Gary Boomer is the Visionary & Strategist of Boomer Consulting, Inc., an organization that provides consulting services and peer communities to leading accounting firms. BCI's vision is to make you more successful and future ready. Areas of focus include: planning, people and processes with technology as the accelerator. Gary is recognized in the accounting profession as the leading authority on technology and firm management.